Some art work is like poetry. But realising that all these may have emotion imbued or expressed, indeed that the very reason for painting or drawing is to offer a unique individual’s point of view, I appreciate that I’m arguing against myself. Still, when pictures strive to be succinct and every line has to count, when a whole story is told with deceptive simplicity, when so much is expressed in a compressed form and when there’s an acute awareness of a sense of balance, harmony, even rhythm (I can’t pretend rhyme has a place in visual art) – well then they share much with poetry. 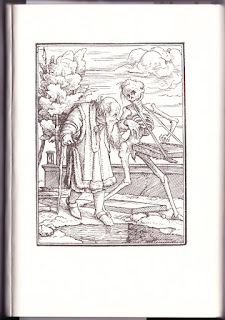 And none more so than Hans Holbein’s sequence of The Dance of Death. 41 tiny images – each no bigger than a match box – depict Death in the form of a skeleton, calling on all manner of people, from Kings, Emperors and the Pope himself through to a peddler, ploughman and little child. Death assumes many moods ranging from haughty to humble, from satirical to seductive, from friendly to ferocious. He hands the Physician a flask of urine, helpfully plays the drum to help the Lady to dance, chats up the Empress, upstages the Preacher, pours the King another drink, helps himself to the Miser’s gold and sweetly fastens round the Countess’s neck a necklace (which happens to be made of little bones). So, like poetry, these miniature woodcuts encompass all human life – and death. Although cut in 1523-6, they have a poetic, Shakespearian universality and relevance. My present choice shows an Old Man who’s given his hand to Death. Accompanied by music from Death, he chats quietly looking into the distance, quite oblivious to where his next step will lead him. It’s a companionable scene. But the clouds are scudding fast, the sands of time are running out in the tell-tale timer and the old chap is about to tumble into his open grave. Unlike many of the images, Death’s expression is uncertain here: it might be kindly and considerate, deceptive, even mocking – resonating with poetry, there’s ambiguity. Before I present my own little piece, I have to add a postscript. 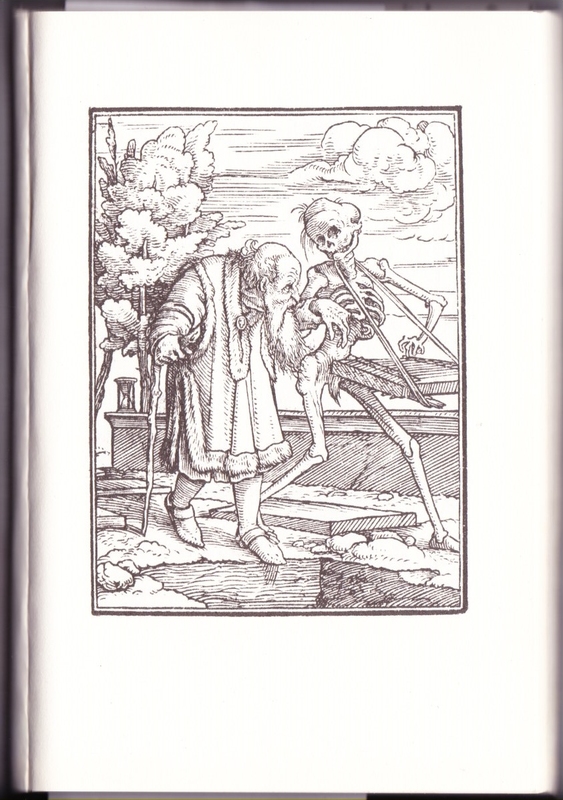 It’s curious that Holbein (or perhaps it’s down to his engraver, another Hans, one Lutzelburger) had such relatively poor knowledge of the skeleton. I’d have thought that in the sixteenth century people would have seen human bones, so that Death’s shoulder, elbow, knee and ankle joints would have been more accurately drawn – not to mention the ulna, tibia and patella, which are all absent. Not that such discrepancies matter much, for Holbein’s Death is a most convincing character. And maybe ‘Art’, like Poetry, has less need to be totally accurate, than powerful. I just had to post this poem while we’re still in 2017. Handel’s Water Music was premiered on the odd, if not magical date of 17/7/1717. from Overture to Air we strolled and we danced staccato, legato, allegro, con brio our melodies flowed down the river, lost as we played them. But he liked what he heard. to breathe in his music, inspired by this water, refreshed and transformed as an echo which travels the river long after we’d played our way home. It's a great poem, Lowell's For the Union Dead. I only recently came across it - at least, that's what I thought - but it's been grunting (I choose the word advisedly) away in my head ever since, especially that fourth verse. to gouge their underworld garage. It took a little while for me to realise why. Before (I thought) I'd read it, I wrote a poem about the new housing estates springing up round our little town. I was thinking about the various creatures that had lived on the field that was to be covered with houses - sheep primarily - and then those that were to follow. The first were, well, a sort of dinosaur. It's not just that it feels as though the effort of keeping summer going can be given up, almost with a sense of relief. No, it's more than that - here's a new season, fresh in its own special way. As September contains a quarter day (itself relating to the solstice) I read that it was a time when people were hired, land was exchanged and debts paid. So various things start now, like the academic year, making it a month for new beginnings - although it draws heavily on recent growth, sometimes hardly noticed. But much more interesting are the arrivals that startle. I mean the fungi - extraordinary things which literally spring up overnight.